A performance at the Aqua Theatre on board the Symphony ofthe Seas from Royal Caribbean Cruise Lines. Cruising for the first time can be daunting. We investigate if Royal Caribbean will make your maiden voyage a memorable experience, for all the right reasons. It’s no secret that cruising is not for everyone. But it has appeals that may surprise and delight more people than give it credit. In other words, cruising could be just your ticket. Probably the most nerve-racking part of joining a cruise for the first time is the thought of being ‘stuck’ on a ship if you’re not enjoying yourself. Royal Caribbean’s sampler cruises are just the ticket to discovering if you’re a cruiser or not. Departing from Sydney, these two- and three-night cruises simply head out into the South Pacific Ocean and back to Sydney, giving you a couple of days to explore the ship and see what cruise life is all about. And if it doesn’t, er, float your boat, then you are back on land in no time. But for many, it’s the start of a whole new world of exploration and three nights is simply not enough! It’s important to remember that it gives you a taste of the experience but not the entire experience – it only gets better from these starter cruises when you get to explore different destinations and have more time to enjoy the entire ship experience. 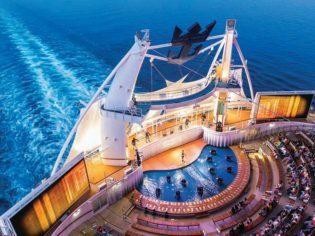 Royal Caribbean’s fleet is the biggest in the world and has been at the forefront of turning the ship experience into a resort destination in its own right… and no, we’re not talking just bingo and buffets. In Australian waters Radiance of the Seas and Serenade of the Seas are very similar ships that offer, among other things, rock climbing, whirlpools, an outdoor cinema and mini golf. Voyager of the Seas has all of the above then an ice-skating rink (plus many Olympic figure skaters to give you a few tips), water slides and a surfing simulator (FlowRider). The indoor pool onboard the Ovation of the Seas. There are several more pools, the outdoor pool and the adults-only indoor Solarium. Ovation of the Seas is part of the newest class of ships (Quantum Class), which takes the entertainment to an even higher level of wonder. The rock climbing wall, kid-friendly water park and FlowRider are just the start. The North Star observation pod soars 90-metres into the sky, RipCord by iFly is a skydiving simulator. In the full-size indoor basketball court you can jump into bumper cars, roller skating and trapeze circus school. And for something a little different, the hi-tech Two70 theatre involves video projections, robotics and human artistry at night but during the day it serves as a huge comfy living room with a bar and cafe. In a world where holiday home rentals are all the rage, it’s nice to have a (real) holiday where all the boring day-to-day chores (i.e. cooking and cleaning) are done for you. Royal Caribbean prides itself on award-winning service. From the moment you board to the moment you disembark, you’ll be well looked after by your stateroom attendant who does a daily housekeeping and turndown service and your dedicated waiter in the main dining room who will know your dietary requirements and preferences. Of course, there are hundreds of other staff members onboard who are there to help you with any questions or needs during your cruise. This is at the heart of the Royal Caribbean experience: giving families the time and choice of activities to have fun together. The Seaplex complex onboard Ovation of the Seas is a bumper car track, full-size basket ball court and trapeze circus school space in one. You are spoilt for choice with family-friendly activities onboard – and it’s all designed to make sure big kids and little kids will have fun. Spend time splashing about in the different pools onboard; watch a film together in the dive-in movie theatre; let the kids burn energy at H2O Zone water park (Ovation and Radiance only); challenge each other on the rock climbing wall; play a round of mini golf; have fun with old-school arcade games; enjoy a Broadway-style show together; see who can stay standing the longest on the FlowRider; or partake in a number of fun classes such as jewellery making, cupcake baking, and the art of folding towels (into goofy-looking animals, not Marie Kondo-style). The wave rider onboard Ovation of the Seas. Happy kids, happy everyone, right? And let’s be honest, the kids want to do their own things without Mum or Dad from time to time. And if that can be guilt-free for mums and dads then that’s even better (if not the Holy Grail). Royal Caribbean’s kids’ programs are designed to give mum and dad a break while entertaining the offspring with fun and immersive activities. The trapeze in action at the Seaplex, a full-sized basketball court for dodgem cars, rollerskating and other activities, onboard Ovation of the Seas. Kids aged three to 11 will love the Adventure Ocean program, which blends fun with education through science, art, imaginative play, storytime and more. Teens won’t get bored in their own dedicated area that has a 3D theatre, an arcade with classics such as Pac-Man and table hockey, a lounge and a dance floor. Meanwhile, the Royal Babies and Royal Tots program is an interactive 45-minute session for your littlest loves, aged six to 36 months. That’s the beauty of cruising. You only have to unpack once while visiting new places almost every day. Stick to the homeland with Australia-based cruises such as the Queensland coast, which stops in Brisbane and Airlie Beach, or head down south on a cruise to Tasmania, visiting Hobart and Melbourne. Say hello to our neighbour with a cruise to New Zealand and wake up in places such as the picturesque ‘Sounds’ (Milford, Doubtful and Dusky), NZ’s only French settlement Akaroa and the capital Wellington. Or if you have more of a penchant for tropical weather, there’s a number of South Pacific cruises, which include ports such as Noumea in New Caledonia, Mystery Island in Vanuatu, and Lifou in the Loyalty Islands. If you want to go further afield and get even more bang for your holiday buck, try a repositioning cruise that takes you from Sydney to the island city-state of Singapore, with stops along the Australian coast on the way. Everything you need onboard is included: meals in the main dining room and the buffet; juice, tea and coffee; entertainment such as Broadway-style shows, live music and comedy, lounge games and contests; activities such as rock climbing, ice skating, mini golf and even the FlowRider; as well as access to the fitness centre and kids’ clubs. All onboard expenses are charged to a SeaPass account, which you can monitor on the TV in your stateroom or at the guest services desk. It’s also best to pre-pay for your optional extras (shore excursions, spa treatments, even alcoholic drinks packages) beforehand. The general dress code for Royal Caribbean is casual; you’re on holiday, so shirts, shorts and thongs are totally acceptable during the day. For dinner, take it up a notch to smart casual – i.e. no shorts or thongs. There are formal nights on each cruise, but it refers only to the main dining room and is a suggested dress code. Theme nights such as toga, disco and masquerade are also optional. Of course there’s wi-fi onboard all Royal Caribbean ships (at a cost), and it’s considered ‘the fastest at sea’. Or you can go old-school and head to the internet cafe onboard. Alternatively, you can choose to live the life of a seafarer and disconnect completely. Some digital detoxing needs to be done on a cruise, right? Royal Caribbean’s cruise ships may look busy, but there’s definitely some chill-out zones where you can get some peace and quiet. The adults’ only Solarium is positioned at the front of every ship, and comprises of swimming pools, whirlpools, a lounge area… and not a whippersnapper in sight. Or set some time aside and pamper yourself with a treatment at Vitality Spa – try a massage, facial, body wrap, or a more intensive medi-spa treatment. If you fancy curling up and reading a good book, head to the ship’s library – perfect for days when the weather’s not so good. Your active life doesn’t need to be thrown overboard when you go cruising, and fitness fanatics won’t be disappointed onboard Royal Caribbean. Better than your average suburban gym, the fitness centre onboard Ovation of the Seas has spectacular ocean views as well. Each ship boasts a fitness centre with a selection of group classes including yoga and spin, as well as equipment to do your own thing. There’s also a running track on the top deck and rock climbing if you want some fresh air while working out. If you prefer to do something a little more fun, hit up the FlowRider surfing simulator; take a dance lesson; and choose more active shore excursions such as snorkelling, scuba diving, hiking or bike riding. Celeb chef Jamie Oliver has opened his Jamie’s Italian restaurant onboard the Quantum class of ship (Ovation of the Seas in Australia). Contrary to popular belief, onboard dining is not just buffets. The whimsical Wonderland specialty restaurant on board Ovation of the Seas is inspired by the Alice in Wonderland stories. Royal Caribbean’s dining offering spans different cuisines and styles, from the main dining room where you are served cuisine inspired by the destination you’re visiting to the casual Windjammer Cafe (AKA your buffet) to snacks such as hot dogs, pastries and sandwiches. The Brazilian Samba Grill serves up churrascuria style BBQ – meat grilled on skewers over coals. There are also specialty restaurants (our favourites) where you can dine at an additional cost including Izumi (Japanese cuisine) Chops Grill (American steakhouse), Jamie’s Italian by Jamie Oliver (Ovation) and 1950s-style diner Johnny Rockets (Voyager). What can be better than cruising with a conscience? Royal Caribbean has partnered with WWF Australia to protect the Hawksbill turtle, a critically endangered species found in the Great Barrier Reef, among other coral reefs around the world. Royal Caribbean is working alongside WWF Australia to educate passengers, as well as working towards other sustainability goals to protect the world’s oceans. Check out the available itineraries from Royal Caribbean for Aussie cruisers. And make sure you have checked out our advice on how to book your first cruise.